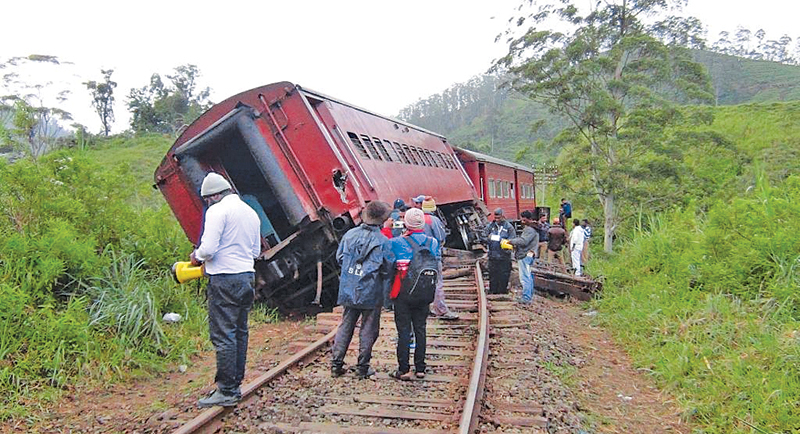 The Railway Department is conducting a special investigation into the derailment of the Badulla bound night-mail express train from Colombo on a bridge between the Hatton and Kotagala railway stations. The train derailed around 2 a.m. yesterday on the bridge called ‘60 feet bridge’. Three passengers who sustained injuries were admitted to Kotahgala Hospital. A three-member committee has been appointed by Railways Operation Superintendent Wijaya Samarasinghe to investigate the incident. The railway track near the bridge was severely damaged owing to the accident. Two trains scheduled to run on the track have been cancelled. Wheel sets of several compartments of the derailed train were seen detached from the compartments. The Railway Department workers of Badulla and Nawalapitiya placed two compartments on the railway track by yesterday evening. The railway bridge has also been damaged in the incident. The Railways authorities have sent train passengers to Badulla after detaching four compartments. Busses were deployed to transport train passengers between Hatton and Kotagala.